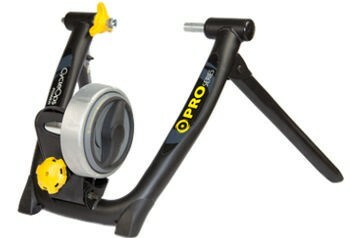 The SuperMagneto Pro turbo trainer comes with four resistance settings, named Easy, Road, Interval, and Mountain. The Easy setting is suited for warm-ups, either before you head out for a more challenging ride or before you increase the resistance level on the trainer itself. The Road setting is equivalent to riding on a flat terrain, and will allow you to cycle for long periods of time and is great for stamina building. The Interval setting ramps up the resistance for a more intense workout, and as its name suggests it is good for interval training, while the Mountain setting really ramps up the resistance and will really push even the most experienced rider. The trainer runs off a magnetic brake and uses four spring-magnets to create the different resistance curves, and a precision-balanced flywheel to offer a smooth and more realistic ride. The standard Magneto was the worlds first progressive resistance magnetic turbo trainer, and the SuperMagneto Pro advances on this by offering 4 different levels of progressive resistance.